The name IKEA is formed. Ingvar Kamprad is entrepreneurial in developing IKEA into a furniture retailer. The IKEA concept starts to take shape. New IKEA stores open and hero products are developed such as POÄNG, KLIPPAN and BILLY bookcase. IKEA expands dramatically into new markets such as USA, Italy, France and the UK. More IKEA classics arrive such as LACK and MOMENT. The IKEA Group is formed and responsibility for people and the environment is seen as a prerequisite for doing good business. IKEA expands into even more markets such as Japan and Russia. IKEA establishes a business partnership in Turkey, with MAPA Mobilya ve Aksesuar A.Ş., a subsidiary of Maya Holding A.Ş. At the age of five, Ingvar Kamprad started selling matches to his nearby neighbours and by the time he was seven, he started selling further afield, using his bicycle. He soon discovered that he could buy matches in bulk cheaply in Stockholm and re-sell them individually at a very low price but still make a good profit. From matches he expanded to selling flower seeds, greeting cards, Christmas tree decorations, and later pencils and ball-point pens. When Ingvar Kamprad was 17, his father gave him money as a reward for succeeding in his studies. He used it to establish his own business. The name IKEA is formed from the founder's initials (I.K.) plus the first letters of Elmtaryd (E) and Agunnaryd (A), the farm and village where he grew up. IKEA originally sold pens, wallets, picture frames, table runners, watches, jewellery and nylon stockings at low prices. Ingvar Kamprad's business outgrew his ability to make individual sales calls, so he began advertising in local newspapers and operating a makeshift mail-order service. He used a local milk van to deliver the products to the nearby train station. 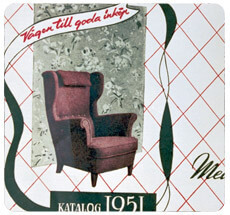 The furniture is produced by local manufacturers in the forests close to Ingvar Kamprad's home. The response is positive and the line expands. IKEA founder sees the opportunity to sell furniture on a larger scale using a catalogue. The IKEA catalogue that we know today is born. This is an important moment in the development of the IKEA concept - for the first time customers can see and touch IKEA home furnishings before ordering them. The showroom is born out of a price war with a main competitor of IKEA. As both companies lowered prices, quality was threatened. By opening the showroom, IKEA clearly demonstrates the function and quality of its low-price products. The innovation is a success; people wisely choose the products with the best value for money. The decision for IKEA to design its own furniture stems, ironically from competitors pressure for suppliers to boycott IKEA. Exploration of flat packaging begins when one of the first IKEA co-workers removes the legs of the LÖVET table so that it will fit into a car and avoid damage during transit. After this discovery flat packs and self assembly become part of the concept. The first IKEA store in Älmhult has 6.700 square metres of home furnishings! At the time, it is the largest furniture display in Scandinavia. While visiting an IKEA kitchen manufacturer, one of the earliest co-workers at IKEA, Gillis Lundgren, notes the simple, practical storage ideas being used in IKEA kitchens and is inspired to apply the same thinking throughout the home. As soon as he gets back to Älmhult he sits down and designs the TORE drawer unit. The 100th co-worker joins IKEA. First IKEA restaurant opens in IKEA store in Älmhult, Sweden. IKEA begins quality testing its products using Swedish testing standards. The ÖGLA café chair is launched with the IKEA concepts of form, function and price in mind. Today it is made of composite plastic for a modern look and reduced shipping costs. The MTP bookcase is a contemporary classic and sees numerous imitations over the years. 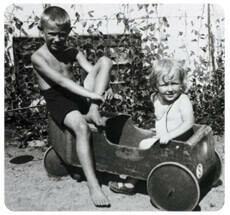 Developing this and other wooden products developed strong relationships between IKEA and polish suppliers during the 1960s. These relationships continue today and are important for IKEA maintaining its low price policy due to low purchasing power of many people. First IKEA store outside Sweden opens in Oslo. Thousands of people queued for the opening of the 31.000 square metres flagship store, IKEA Kungens Kurva. The store has a circular design, inspired by New York's Guggenheim Museum. The store's success lead to the opening of a self-serve warehouse - and an important part of the IKEA concept was born. Additionally, Accenten was opened, where customers can buy quality cooking items at low prices. This inexpensive, hard-wearing and easy-to-process material is a natural fit for IKEA. In 1969, the PRIVAT sofa was designed by architect Åke Fribryter. PRIVAT has a particleboard base with a white lacquer finish and brown floral cretonne covers by textile artist Sven Fristedt. This sofa, with the beauty of its straight lines and incredibly low price was an instant hit. The first IKEA store opens in Copenhagen. First IKEA store outside Scandinavia opens in Zurich. TAJT, a multifunctional sofa/recliner, is one of many good examples of how IKEA sometimes does things differently. By using a low-cost raw material from another industry, in this case denim, a hard-wearing and low-priced product is created. Now it’s denim’s day of glory! First IKEA store opens in Munich. Success in Switzerland paved the way for rapid expansion into Germany, which today is IKEA's largest market. Choosing a manufacturer for the SKOPA chair, designed by Olle Gjerlöv-Knudsen and Torben Lind, is wonderfully simple, even if it raises a few eyebrows. SKOPA is developed by a supplier that usually makes plastic buckets and bowls, creating a chair in which form and function are not compromised by an unorthodox solution. First IKEA store opens in Sydney. First IKEA store opens in Vancouver. Another IKEA classic is born, the comfortable armchair POEM made of laminated wood, which will later evolve into POÄNG. Ingvar Kamprad writes The Testament of a Furniture Dealer and in 1976 it is published. It documents IKEA's vision and business idea and has a strong influence on the development and vitality of IKEA's culture. The BILLY bookcase is introduced into the range as an IKEA classic. The first IKEA store opens in Rotterdam. The KLIPPAN evolves into a sofa tough enough to stand up to the kind of punishment only children know how to dish out, yet soft enough for them to fall asleep on during bedtime stories. The entire cover can be removed for machine washing. This low-priced, functional coffee table is made with a technique that is normally used for interior doors, making the table very strong and light. This sandwich technique is called board-on-frame and will be used in many IKEA products in years to come. First IKEA store opens in Paris. The IKEA Group is formed. Its owner is a foundation, the Stitchting INGKA Foundation, which is based in the Netherlands. To complement the LACK table, LACK shelves are designed. The first IKEA store opens in Brussels. 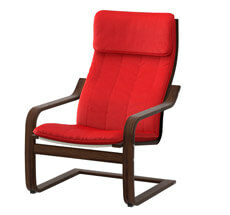 IKEA designs a series of high-quality furnishings using some well-loved materials - birch wood, leather and cretonne. The range has everything you would expect of high-quality classics, except the high price tag. STOCKHOLM is a winner of the Excellent Swedish Design Award. The IKEA catalogue print run expands to 45 million copies, in nine languages. IKEA FAMILY, the new customer club, is launched. 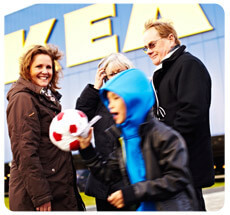 Today, IKEA FAMILY is in 16 countries (over 167 stores) and has about 15 million members. First IKEA store opens in Philadelphia. IKEA now has 10.000 co-workers and 60 stores in the IKEA Group. When IKEA looks for a suitable manufacturer, visits to a supermarket-trolley factory prove successful in utilising knowledge of strength and stability. IKEA takes this as a starting point in creating a stylish, comfortable and low-priced sofa with a modern look. Complementing the sofa and designed in 1987, the pedestal table won the Excellent Swedish Design Award, of which we are highly proud. Ingvar Kamprad retires from Group Management to become an advisor to the parent company INGKA Holding B.V. Anders Moberg becomes President and CEO of the IKEA Group. First IKEA store opens in Warrington, Manchester. First IKEA store opens in Milan. First IKEA store opens in Budapest. The IKEA Group develops an environmental policy to ensure that the company and its co-workers take environmental responsibility for all activities conducted within its business. First IKEA store in former Czechoslovakia opens in Prague. 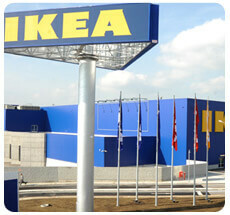 The first Polish IKEA store opens in Poznan. IKEA acquires its own sawmills and production plants and establishes the industrial group Swedwood to produce wood-based furniture and wooden components. The IKEA Group becomes a member of the global forest certification organisation Forest Stewardship Council (FSC). Daring to be different. A whole furniture series for children is introduced that not only meets the demands of the wildest childish imaginations, but also stands up to the wildest of children's games. All the products are made of tough, resilient materials and have turned a corner in safety. Launched at the same time as the Furniture Fair in Milan, PS stands for POST SCRIPTUM, or to put it differently it is the latest addition to the world of IKEA design. 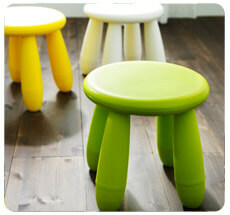 The IKEA PS collection is one way of sharing the design values of IKEA: form and functionality at a low price. IKEA PS gives designers free rein to shape the latest creations, where the aim is to create products that are emotional, fun and less predictable, appealing to those who prefer an individual taste to a common style. The first IKEA store opens in Madrid. The IKEA web site www.IKEA.com is launched. IKEA offers furnishings for the entire family. But because kids are the most important people in the world, IKEA decided to develop a range specifically for them. We work with many experts to develop products that are good for the development of kids' co-ordination skills, social skills and creativity. The products we launched in 1997, and continue to sell today, are chosen by the most important experts: kids themselves. Even our stores take care of children's needs by providing playground areas, children's room settings, baby areas and special meals in the restaurant. 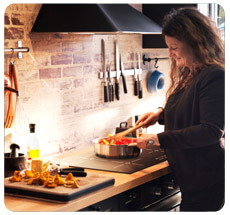 The IKEA 365+ range is launched - a range of functional, attractive everyday products for preparing, cooking, serving and eating food. The products are designed to make kitchen work easier and more enjoyable, at the same time bringing a little more beauty into everyday life with their forms and colours. First IKEA store opens in Beijing. IKEA employs its first forestry manager to work fulltime in securing sustainable use of forestry resources. The IKEA group grows to 50.000 co-workers and has 158 stores in 29 countries. Anders Dahlvig becomes President and CEO of the IKEA Group, taking over from Anders Moberg. The unique Big Thank You event on 9 October 1999 is a millennium reward for the many co-workers within the IKEA Group. The total of all sales on this special day, worldwide, is divided among all co-workers - in total about 84-85 million Euros. It is a great way to thank hard-working IKEA co-workers for contributing to the company's ongoing success. The IKEA Group donates funds to UNICEF and Save the Children to assist in the re-building of schools, the provision of educational materials for children and the special training of teachers in war-torn Kosovo. VÄRDE is a new way of thinking about kitchens. Its unique modular design allows customers to create an entire kitchen from scratch or simply add a piece here or there. The innovative design, functionality, ergonomics, ecological compatibility and durability combined with attractive design, helps VÄRDE win the Red Dot Award for Highest Design Quality, which is organised by Design Zentrum Nordrhein Westfalen in Germany. First IKEA store opens in Moscow. The code of conduct called The IKEA Way on Purchasing Home Furnishing Products (IWAY) is launched. This defines what suppliers expect from IKEA and vice versa in terms of legal requirements, working conditions, active prevention of child labour, external environment and forestry management. In addition to this, IKEA also introduces The IKEA Way on Preventing Child Labour to ensure that no child labour is used by our suppliers or their sub-contractors. The IKEA Group, in co-operation with UNICEF, initiates a broad community programme in northern India to address the root causes of child labour. The project covers 500 villages, providing more than 80.000 children with an opportunity for an education. At present, the project covers a range of initiatives, such as providing alternative learning centres, health and nutrition, education, empowering women and forming women's self-help groups. E-shopping is launched in Sweden and Denmark. Since then many other IKEA shops have started offering online shopping. The IKEA Group initiates its own rail operations through IKEA Rail AB. The train runs one round trip a week between Älmhult, Sweden, and Duisburg, Germany. In 2004 rail operations are taken over by an external company, with IKEA continuing to use this route. The use of rail continues to be an important part of the IKEA strategy to promote sustainable transportation of IKEA materials and products. IKEA becomes one of the first manufacturers to produce furniture with patterns produced directly on fibreboard and particleboard, in a factory in Poland. This technique is called print-on-board. IKEA has a long tradition of co-operating with different NGOs, such as Greenpeace, a co-operation which started in 1991. Over the years, this has helped IKEA phase out the use of bleach for printed materials, the use of PVC in products, as well as working towards protecting natural intact forests. The IKEA Group moves its head office from Humlebaek in Denmark to Leiden in the Netherlands. A new product-recovery concept is implemented in more than 100 IKEA stores in Europe to ensure that returned products are, where possible, repaired instead of being wasted. In 2002, the global conservation organisation WWF and the IKEA Group join forces to promote responsible forestry in priority regions around the world. The two organisations initiate a series of global and regional forest projects to support the development of responsible forestry. The focus is on innovative products with the specific ambition to inspire children to play and enjoy physical activity. The range also includes the successful IKEA PS BRUM soft toy. During 2003-2004 customers help to raise more than 2.1 million Euros by purchasing a PS BRUM soft toy at an IKEA Group store. These funds are donated to UNICEF projects for children in Angola and Uganda. First IKEA store in Lisbon. The IKEA Group publishes its first Social & Environmental Responsibility Report. It is launched on the web and gives information as well as facts and figures. The IKEA New Haven store in the US is the 200th IKEA Group store worldwide. First IKEA store in Turkey opens in Ümraniye, Istanbul. Opening franchise stores all around the world, IKEA strikes a partnership in Turkey with MAPA Mobilya ve Aksesuar A.Ş., a Maya Holding A.Ş. subsidiary. The first store opened in Ümraniye, Istanbul on 5 May, 2005, achieves great success for IKEA, and is followed by the 2nd store in Bornova, İzmir on 6 April, 2006. The third IKEA store of Turkey, and second in Istanbul, opens its gates on 8 November, 2007, in Bayrampaşa. A 4th store follows in Osmangazi, Bursa, on 13 November 2008 while the 5th IKEA store in Turkey is opened in Mamak, Ankara on 23 June, 2011. A complete and coordinated collection of bedroom furnishings is launched, including everything from mattresses to smart storage solutions and textiles for all tastes. IKEA wants to make life in the kitchen easier, after all it is one of the most-used rooms in the house. So IKEA looks into all the ways life in the kitchen can be more fun. The result is a wide range of coordinated kitchens and dining furnishings that make kitchen life easier. What if the wildest ideas become the wisest solutions? The fifth IKEA PS collection is launched under the headline 'What If...?' Twenty-eight designers develop a range in which innovation is the key word for materials, design, function and techniques. The range includes everything from rugs with hinges and pillows for your feet, to t-shirt-shaped cushions and rocking dining chairs made from wooden plastic. IKEA begins working with the WWF to promote better methods of cotton cultivation. About 2.000 farmers in Pakistan are being trained in Farmer Field Schools. In 2006, the cotton cultivation project expands to India, where 500 farmers are being trained. The discovery-based learning process encourages the farmers, some of them illiterate, to adopt more sustainable cultivation practices that serve as a good example to others in the region. Schools in Liberia and Burundi receive 9.000 tables each for a UNICEF school project. After the tsunami, IKEA gives UNICEF an in-kind donation of 125.000 bed sheets, 100.000 quilts, 18.000 blankets, 145.000 toys and 300 mattresses to help victims in Indonesia, Sri Lanka and India. An organisation called IKEA Social Initiative is formed to handle global community involvement through its partnerships with Save the Children and UNICEF. After previous explorations of Japan with a joint venture in the 70s, the IKEA Group opens its first fully-owned store in Tokyo. IKEA launches its own food label covering about 30 percent of the 150 products in its food range. The range focuses on high-quality food products based on Swedish recipes and traditions at low prices. The products have an IKEA label and are sold in Swedish Food Markets in IKEA stores and are also served in IKEA restaurants. The IKEA Group exceeds 100.000 co-workers and operates in 44 countries. The IKEA Group and the WWF join forces to curb illegal logging in Russia and reward legal forestry in Russia and China. The WWF Russia is actively participating in government working groups to find solutions to illegal logging on national and regional levels. For example, regional anti-illegal logging brigades receive technical assistance to conduct monitoring and gain control over logging activities. The Pakistan earthquake in October 2005 leaves many people in a desperate situation. Over 350.000 IKEA quilts are donated to UNICEF and their efforts to help improve the living conditions of the survivors. IKEA Haparanda opens the most international IKEA store yet. It is uniquely placed on the border between Sweden and Finland and a catchment area that also includes Russia and Norway. The IKEA Group and the WWF start to co-operate on projects aimed at reducing greenhouse gas emissions generated by IKEA operations. The agreement covers improving energy efficiency and the use of renewable energy at IKEA suppliers, and developing sustainable customer transportation to and from IKEA stores.